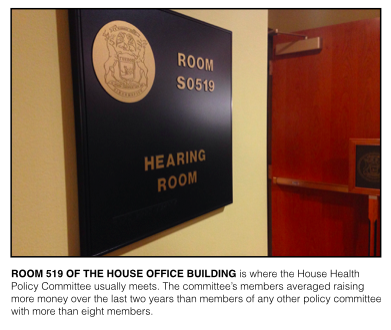 LANSING — Decisions made on the fifth floor of the Michigan House Office Building, where the Health Policy Committee meets, directly impact the bottom lines of hospitals and insurance companies across the state. Hospitals, insurance companies, drug makers and professional associations representing all types of health care workers are among the most active lobbying groups and campaign donors in Michigan. According to a new analysis of 2015-2016 fundraising records by the Michigan Campaign Finance Network (MCFN), the groups’ efforts have benefited lawmakers who have key votes on health care-related bills. Over the last two years, members of the House Health Policy Committee — the panel that takes the first votes on health care proposals in the House — averaged raising more money than any other House committee with eight or more members who served throughout the two-year session. The 20 members of the House Health Policy Committee that served the entire session averaged raising $186,011 each. 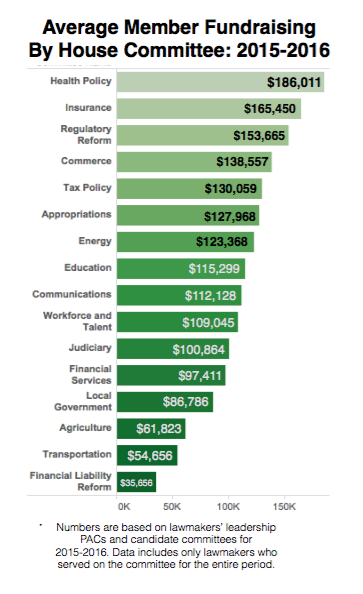 The average was more than $20,000 higher than the second-place committee, which is also connected to the health care field: the Insurance Committee. Members of the House Insurance Committee, which takes the first votes on bills regulating the insurance industry, averaged raising $165,450 each over that period. To arrive at the figures, MCFN analyzed 2015 and 2016 state-level campaign finance reports of representatives’ campaign committees, which they use to fund their own election efforts, and of lawmakers’ leadership political action committees (PACs), which lawmakers use to raise money to help fund other lawmakers’ campaigns. MCFN averaged the lawmakers’ fundraising totals across policy committees they served on, considering the 16 committees with eight or more members serving throughout the session. The analysis found a wide range of fundraising averages. Members of the Financial Liability Reform Committee, which considers bills related to government finances, averaged raising just $35,656. The committee met only 21 times over the two years, according to meeting minutes. The Health Policy Committee met 51 times. Members of the Agriculture Committee and the Transportation and Infrastructure Committee also tended to raise less money. Transportation members averaged raising $54,656, and members of the Agriculture Committee averaged raising $61,823. Members of the Health Policy Committee averaged raising three times what members of the Agriculture Committee raised. The Health Policy Committee featured three Republicans from swing districts that ran in expensive re-election races in 2016: John Bizon (R-Battle Creek); Holly Hughes (R-Montague); and Klint Kesto (R-Commerce Twp.). The committee also featured Rep. Rob VerHeulen (R-Walker), who ran for a leadership position in the House, and Rep. Mike Callton (R-Nashville), the committee’s chair. Callton’s candidate committee and leadership PAC raised a combined $324,879 since the 2014 election. He was term limited from the House at the end of 2016 and couldn’t seek re-election. He has formed a candidate committee to run for the Senate in 2018. According to MCFN’s tracking, the top five donors to Callton, a practicing chiropractor, over his career in the House, include four health care-related interest groups: Blue Cross Blue Shield, which has given $31,500 to Callton; the Michigan Health & Hospital Association, which has given $29,375; the Michigan Chiropractic Society, which has given $28,580; and the Michigan Medical Society, which has given $16,625. 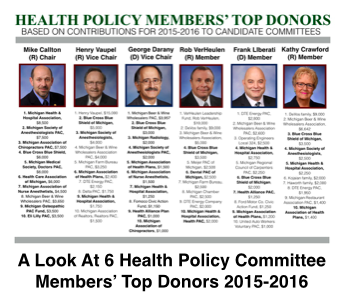 Callton said before he became chair of the Health Policy Committee, he saw a report that found the Health Policy Committee was the biggest fundraising committee over a 30-year period. Callton said he was interested in working on health care policy regardless of the fundraising statistics. But he added that being on the Health Policy Committee made him a better fundraiser. The reason the Health Policy Committee is good for fundraising is because there are many groups with financial resources interested in what happens with the committee, Callton said. They include insurance companies, hospitals, health care provider groups and pharmaceutical companies, he noted. The main PACs of Blue Cross Blue Shield and of the Michigan Health & Hospital Association are among the top 10 most active PACs overall in the state. Blue Cross Blue Shield’s PAC had raised $1 million for the two-year cycle as of Oct. 20, 2016, making it the sixth most active political committee in the state over that time period. The Health & Hospital Association’s PAC had raised $789,517 over that period, making it the ninth most active in the state. The PACs gave thousands of dollars to members of the House Health Policy Committee and other lawmakers in 2015 and 2016. 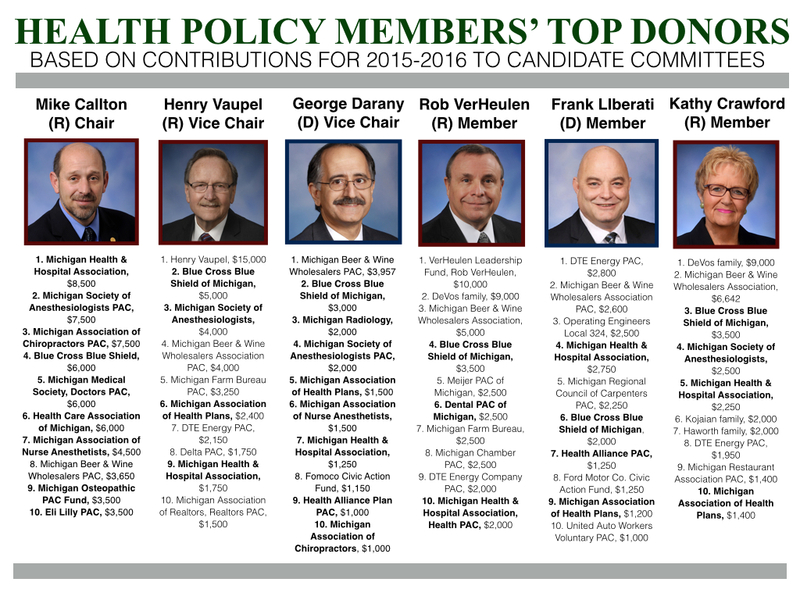 Over that time period, both Blue Cross Blue Shield and the Michigan Health & Hospital Association ranked among the top 10 donors to the campaigns of 13 of the 20 members of the Health Policy Committee. Seventeen of the 20 had at least one of the two PACs among their top 10 campaign donors for 2015-2016. Both organizations actively lobby for and against bills before the committee. For instance, in the spring of 2016, Blue Cross Blue Shield and the Michigan Health & Hospital Association spoke out against a package of bills the Health Policy Committee was considering. The bills, sponsored by Rep. Edward Canfield (R-Sebewaing), a physician, would have prohibited hospitals from denying admitting privileges to physicians for not maintaining national and regional certifications. They also would have prohibited insurance companies from requiring physicians to maintain the certifications in order to reimburse claims. The bills didn’t make it out of the committee. There are many other PACs and organizations involved in policy-making in the health care field as well. A variety of them rank among the 150 most active PACs in Michigan. They include the Michigan Association of Health Plans (61st), the Michigan Association of Nurse Anesthetists (66th), the Michigan Society of Anesthesiologists (69th), the Health Care Association of Michigan (71st), Spectrum Health (120th), the Michigan Osteopathic Association (122) and the Henry Ford Health System (125th). There are other smaller groups that make contributions as well. For example, on Sept. 9, 2015, the Health Policy Committee held a hearing on statewide vaccination standards for students. Thirteen days later the Michigan Vaccine Freedom PAC contributed $2,500 to Callton’s campaign committee, according to campaign finance reports. The PAC's website says it aims to ensure that the value of vaccine choice "remains at the forefront of political discourse" and to promote "both candidates and incumbents who strongly support our values." Philosophically, Callton said, supporters of the PAC saw something in him, and chiropractors in general have an affinity for their issue, he added. The PAC's supporters were also energized by bills on vaccinations that had been introduced by another representative, Callton said.